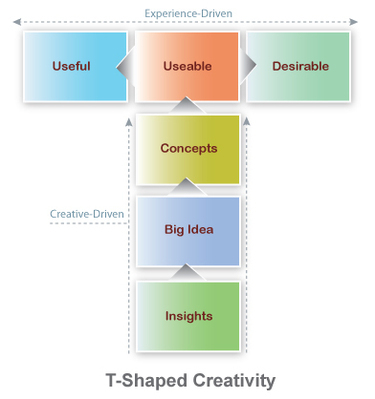 T-Shaped Creativity is a way of looking at a type of creative process situated at the intersection of Interactive Marketing+Experience Design. This visualization looks simplistic—but in fact is difficult to pull off. It entails getting the likes of Storytellers, Brand Strategists, and Experience Designers to coordinate activities. Take away just one "building block" of the "T"—and the Interactive Experience is incomplete.